Q. Godrej Securities Solutions has been enjoying phenomenal growth in sales and ROCE for the last two years. How would you explain the results? A. We provide Physical Security Solutions (such as safes, lockers, strong room doors) for banks, institutions and retail. The demand of this segment has been growing consistently at a CAGR of 26% year on year for the last seven years. Prior to 2010, we supported the growth by investing in capacity. In the last two years, we have grown much faster than we did in the previous years. At the same time, we were able to get about three times the output we did in the previous years without any additional investments. Q. How could you extract such high output from the same capacity? at assembly leading to loss of capacity. 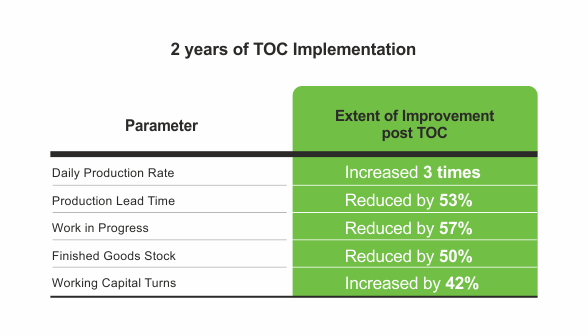 In 2010, we started the implementation of Theory of Constraints processes by partnering with Vector Consulting Group. After deploying the flow concepts of TOC, synchronization of these components at assembly improved dramatically. We started achieving the record output almost every day of the month as opposed to bunching in the latter half of the month. Moreover, fire-fighting reduced significantly. This released the bandwidth of management to focus on improvements in the manufacturing line set-ups and working on capacity release projects that further increased output. Q. What were the major paradigms shifts for you and your managers? A. Earlier we always thought higher WIP leads to higher output. We realized that this is not correct. One of the biggest paradigm changes we implemented is the system of pull, where inventory was pulled into the system based on the daily gap in a pre-defined WIP level, which was set at half of the previous levels. The lower WIP ensured focus on fewer orders, thus increasing flow. Q. What challenges did you face in implementation? How did you align the various stakeholders to the new change? A. The biggest challenge was to change the established mindset of managers to the new way of working – moving from monthly to daily planning, aligning production to working on sales orders rather than focusing on local output. When people saw dramatic improvements in inventory and output in a very short time, the initial skepticism gave way to infectious enthusiasm. Q. What kind of cultural change was required to implement the new paradigms? A. Cultural change was an effect of the implementation. For example de-synchronization of parts and massive month end skew was a source of stress and constant fights between various departments. When flow became uniform with increased output, the team work improved significantly.